Apple’s 10th anniversary smartphone arrives in Korea on Nov. 24 at a price of 1.42 million won, around $270 higher than in the US. The US tech giant announced Tuesday iPhone X will be available in 10 more countries including Korea, Thailand and Turkey on Nov. 24. The preorders will start on Nov. 17, a week ahead of the official launch. 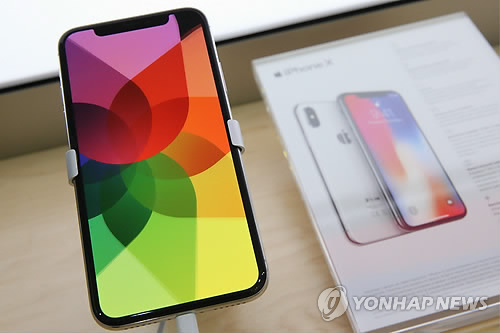 The iPhone X in Korea is priced at 1.42 million won ($1,275) for the 64 gigabyte model and 1.63 million won for 256 gigabyte model, according to local telecom operators. The prices of iPhone X in Korea are around $270 higher than in the US. In Apple’s homeland, the 64 gigabyte model is sold for $999. The prices in Korea are also higher than in other Asian countries. The 64 gigabyte model is priced at around $996 in Japan, $1,104 in Hong Kong and $1,032 in Canada. “Apple sets the price for their products (without negotiating with local carriers) considering the demand and market conditions of each nation,” said an official of one of the nation’s three telecom operators. Korean smartphone makers, Samsung Electronics and LG Electronics, usually discuss prices with the main telecom operators -- SKT, KT and LG Uplus -- before launching their new phones here. “The price differential and usual late launch show that Apple still doesn’t view Korean consumers as important,” said Shin Hyun-doo, chief of non-profit Korea Consumer Association. Despite Apple’s solid sales here with its quarterly market share reaching as high as 20 percent last year, Korea has been on the second or third list of countries for iPhone release to date. Apple Korea did not respond to a request for comment. Apple’s bezel-less 5.8-inch iPhone X is the first iPhone with an organic light-emitting diode screen and touch ID face recognition technology. It sports a dual-lens, 12 megapixel camera and front-facing camera with a resolution of 7 megapixels. Apple’s another flagship smartphone, the iPhone 8, began preorders on Nov. 3 and saw 140,000 units sales over the weekend. The initial sales of the iPhone 8 series are around 60 to 70 percent those of the iPhone 7, according to industry watchers.